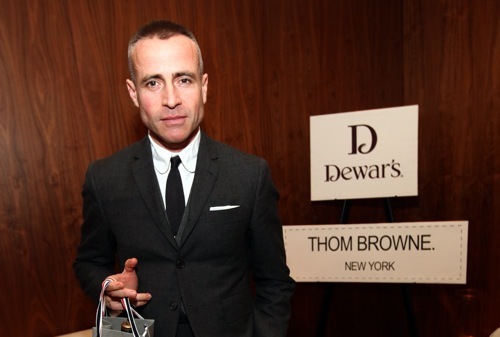 Thom Browne holds a "Browne Bag" from Dewar's. But admit it, you can't take your eyes off his suit and ankles. The chances of us ever being able to afford and justify buying a Thom Browne suit are slim. The chances of feeling comfortable in one of Browne’s signature shrunken suits? Even slimmer. This is the time of year many liquor companies offer holiday trinkets that come with the purchase of booze — trinkets like skull shot glasses or waxed-dipped Christmas ornaments. 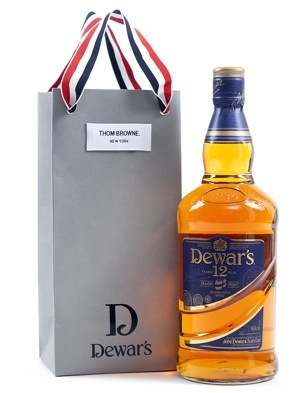 Dewar’s went with a simpler approach, as they teamed with Browne to develop a minimalist bag to go with a bottle of Dewar’s 12-year-old scotch. 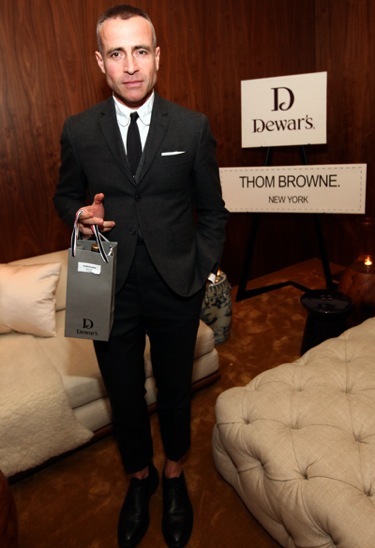 To commemorate the launch of the Dewar’s “Browne Bag,” a small soiree was held on Dec. 6 in the Screening Room at the Public hotel of Chicago. Browne was in attendance, sporting his usual carefully cropped hair and wearing one his precisely tailored suits along with white, club-collared shirt and black tie. We had the opportunity to talk with Browne about his suits, attending Notre Dame, and his favorite holiday gift. Here’s what he had to say. On how he takes his scotch: “Straight up.” He mentioned he’s not a huge scotch drinker, but his father’s scotch of choice was Dewar’s. On his favorite gift that he’s received in the past few years: A vintage Cartier watch (which he was wearing that night). The Dewar’s “Browne Bag” retails for $28 and is carried at Lush Wine & Spirits (Three locations: Roscoe Village: 2232 W. Roscoe * West Town: 1412 W. Chicago * University Village: 1257 S. Halsted). “Browne Bags” are limited — we recommend getting in touch with Lush to make sure they are still in stock. To see Thom Browne’s latest men’s apparel, visit ThomBrowne.com.